Ladder stitch is one of the many off-loom beadweaving stitches that you can adapt to use with Tila beads. In this beginning level project, we stitch a single row of Tilas with bright seed bead edging. Tip: The bold capital numbers above are bead pattern I.D. numbers. They're used throughout this tutorial to identify particular beads. Prepare an arm-span length of beading thread, and thread the needle. Fold over six-to-eight inches of thread for single-strand beadweaving. Because we're using nylon thread, it's important to stretch and condition (or wax) your thread before you begin stitching. Pick up 1A (a Tila bead) and slide it down to about ten inches from the end of the thread. (We'll use those ten inches later for an end loop.) Then pick up 1C, 1B, and 1C. Pass down through the second hole in A, and pull the thread taut. Pick up another set of 1C, 1B, and 1C, and pass up through the first hole in the A bead and the first C that you initially picked up. Hold the Tila between your fingers, and pull the thread taut again. Reposition the needle by passing through the next B and C and down through the A again. Pick up 1D, 1A, and 1D. Pass down through the first A again, then through the first D, and up through the second A again. Pull the thread taut. Pick up 1C, 1B, 1C, and pass down through the second hole in the second A. Pull the thread taut, and then pick up another set of 1C, 1B, and 1C. Pass up through the first hole in the second A, then through the previous set of 1C, 1B, and 1C, and finally down through the second hole in the second A. Pull the thread taut again. 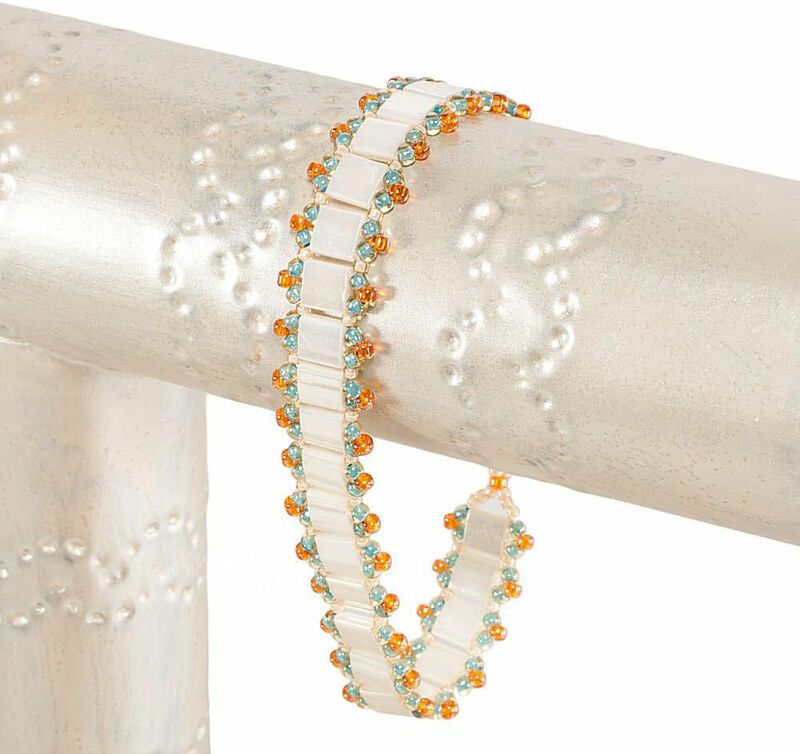 Repeat Steps 4 and 5 to continue this modified ladder stitch until you reach your desired length of bracelet band. This should be the total length of the bracelet less about 1.5 inches to accommodate the end loops and clasp. If you arrive at a point where you have only six-to-eight inches of thread left to work with, stop and add a new thread. Begin the first end loop by picking up 3D, 1B, and 7D. Slide them down against the beadwork, and then pass back through the 1B. Hold the loop in your fingers while you pull the thread to cinch up the tension. Pick up another 3D, and pass through the last hole in the last A. Pull the thread taut. For extra security, pass through the entire end loop again, following the path of the initial thread. Weave-in this end of the thread, navigating through the beadwork and following the path of existing thread. Make two or three half-hitch knots along the way. When the thread is securely woven-in, trim it close to the beadwork. Thread the needle on the long thread tail at the other end of the bracelet band. Stitch the second loop. Weave-in and end that thread. Use pliers to attach the lobster clasp and the figure-eight connector to the end loops. The bracelet is now complete!